With extensive customization options and sound frequencies tailored to each ear, the Audeara A-01s are technically-impressive headphones for committed audiophiles. They're best suited, however, to appreciating music rather than getting lost in it. The Audeara A-01 headphones really want to be perfect. Aimed at producing a tailored listening experience, the Audeara A-01 headphones were developed in tandem with medical professionals. Much like you would wear prescription glasses matched to the capabilities and weaknesses of your eyes, Audeara hopes to offer an audio device you can calibrate to your own listening needs. The company has some curious beginnings with its first pair of headphones, having come into being with a crowdfunding campaign on Kickstarter. The audio startup managed to raise over AU$450,000 (around $350,000, or £260,000) in Australia, where the company is based, though the AU$499 (around $675/£375) headphones also ship worldwide. With a stated mission to "deliver perfect sound, always", do the A-01s live up the hype? The design of the Audeara A-01 headphones is largely understated. The straightforward black headphones come in a simple, matte finish, with the Audeara logo lightly embossed on the outside earcups. These are very well-made headphones and every section of the build boasts the same premium craftsmanship. The earcups offer plush padding, with a soft underside to the band to minimize the pressure exerted on your head. The left and right cups are also clearly marked on the inside mesh, meaning you shouldn't find that you've accidentally swapped your two carefully-calibrated ears around. The buttons along the edge of each cup are satisfyingly tactile, with the feel of a bakelite radio, and are relatively easy to find with your hands. We had a slight concern, however, with the size. We found the cups snug – if not slightly stifling – and they quickly warmed up in our test, although the premium-feel padding on the cups and band ensured a good level of comfort throughout. The band can also only extend a very short distance. While it should fit most users, some may find they come up slightly on the small side. To clarify, the Audeara A-01 headphones are not ready out of the box. When we first put the headphones on, we found that any music we played came out in a somewhat flat, dull tone. The audio is wonderfully clear, but lacking much presence for highs and lows. They gave the impression of listening to a speaker a slight distance away: audible, clear, but far less immersive than we’d hope for the price. This nearly all changes when you start tinkering with Audeara's EQ app. Downloaded to your phone from the App Store or Google Play, Audeara's app essentially allows you to fine-tune your audio output across various high, mid, and low frequencies – a process that’s performed separately for both ears. Audeara's ambition is to allow you to create your own 'prescription' for your ears, in the same way as an eye test would create a prescription for a new pair of glasses. The shortest 'ear test' takes you through 10 distinct frequencies, playing a number of successive beeps while you tweak the prominence of each frequency on a sliding scale – much like the mixing desk controls in a recording studio. We fully recommend making use of the longest test (around 15 minutes) to maximize the improvements to your listening experience. We found ourselves repeatedly jumping back into the app to tweak the output and see what effect it had on various songs on our playlist. For a hobbyist who wants to experiment, without investing in more complex editing software, you could happily spend hours tinkering with the frequencies to see the results; others, however, may find the process somewhat time-consuming. The Audeara A-01s offer pretty much what we'd expect from a premium set of headphones. 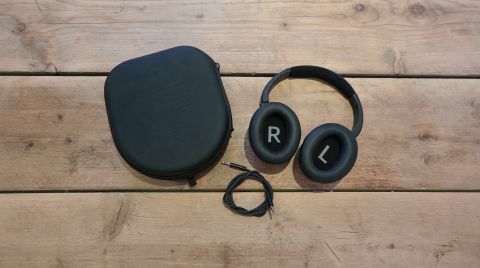 They come with full Bluetooth 4.2 functionality for wireless play, alongside a welcome 3.5mm headphone jack for those wanting a tethered connection. They also offer active noise cancelling, an often indispensable feature in crowded areas or on a morning commute. There's a noticeable improvement with it activated, though we found the natural sound isolation on these snug, well-padded headphones rarely required the additional help. Even when using the headphones in wireless mode with active noise cancelling, they should last you for an impressive 35 hours, with that extending to 65 hours with noise cancelling disabled. You won't be able to charge and play at the same time, but the battery life will mean you won't come across this issue very often. The stress on clarity, and on highlighting the frequencies your ears may naturally struggle to pick up, means you don't really require a booming output to hear the detail on each track. This also means the headphones refrain from jumping to a sound level they can't maintain without distortion. The flipside of this is that you really can't crank up the volume very far. The Audeara A-01s are headphones that are designed to care for your ears, and you're in no danger of bursting your eardrums. While the audio quality can't be faulted, the controlled soundstage can feel slightly limited in that regard. They’re really best suited for dedicated listening sessions where audio detail is crucial – say with instrumental, classical, or pop – rather than cranking out head-banging rock or bass-heavy dance tracks. These are headphones for appreciating music, not getting lost in it. Even after tweaking our EQ prescription to boost the bass, we found the headphones stronger for blasting, say, Tina Turner's vocals than the beats on Deadmau5's Ghosts 'n' Stuff. And we found that trying to 'game' the system to adjust this could easily throw our calibration off-balance. While the customization offers huge scope to individual listeners, it also requires a level of commitment and attention to get the full benefits. Audeara has set out to deliver 'perfect sound'. And for the right listener, with the right genres of music, calibrated correctly, this is what the Audeara A-01 headphones offer. We never found the soundstage as immersive as those created by other premium over-ear headphones at this price range, such as the Sennheiser Momentum Wireless. But in offering a highly personalized listening experience, and showing more consideration for your eardrums than many manufacturers, the Audeara A-01 headphones provide a level of care and customization that’s far ahead of the competition.